Happy New Year to our wonderful readers! I hope you all had a fantastic time celebrating yesterday and there are not too many sore heads among you? 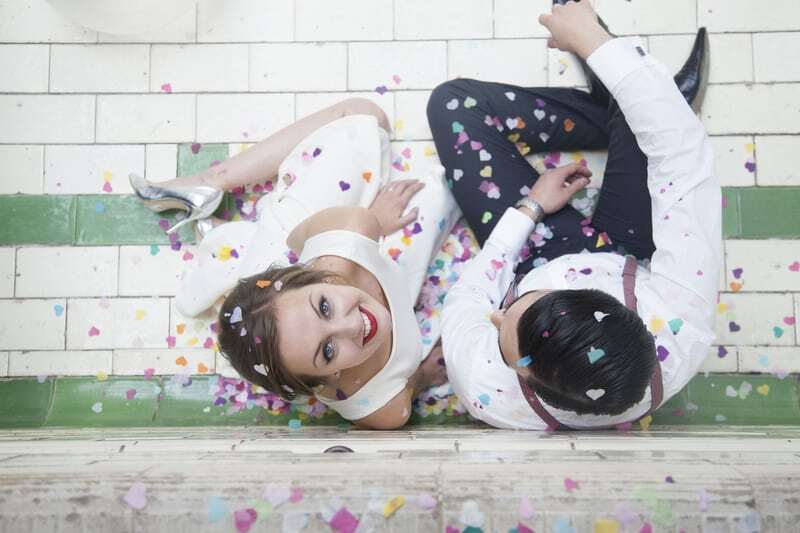 You know how much we love to celebrate and you know how much we love confetti so to welcome in 2015 we wanted to share this super fun and quirky styled shoot with you, complete with lots of colourful confetti, dancing and giant balloons! It might just be the tonic you need to get yourself up and enjoying the first day of 2015. “Victoria Baths is such an inspiring location, I’ve been wanting to shoot in it ever since I first step foot in there! It’s an old disused Edwardian swimming pool which has an abundance of rooms, including an empty original swimming pool, complete with beautiful poolside changing rooms. There are also so many gorgeous features, including stained glass, turnstiles, and wooden seating for ‘spectators’ to watch.